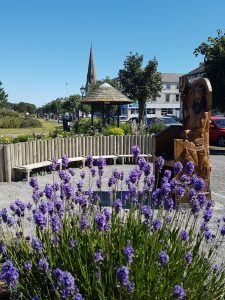 Silloth Green in Silloth-on-Solway, Cumbria has been recognised by the Green Flag Award Scheme as one of the very best in the world. The Green is among a record-breaking 1,883 UK parks and green spaces that will today receive a prestigious Green Flag Award – the mark of a quality park or green space. Silloth Green is one of the largest village greens in the North of England. It boasts spectacular views over the Solway Firth to Criffel and the Caerlaverock Hills in the North, and the Lake District to the South. The Green forms a green link between Silloth’s grand Victorian townscape and the sea front promenade, for many years attracting visitors seeking fresh sea air and recreational facilities. After extensive refurbishment work, the Green now boasts a modern Water Splash play area, a woodland adventure play area, a Putting Green and a BMX track. Beautiful oak picnic tables and benches are to be found in various locations, with accessible footpaths. Along Criffel Street, some Victorian style lighting was installed, in-keeping with the heritage of the town. The Edwardian ladies’ toilets built in 1910 and the spectacular Victorian pagoda overlooking the sea were also sympathetically refurbished. A new addition to Silloth Green this year is the fairy trail through the pines for kids to explore and there are plans for a new 0-5yrs Children’s play area which is to be installed in the coming weeks. Another new addition is a replica Hudson Bomber built by skilled apprentices from Gen2 at Workington which is sited above a flowerbed, planted out in the shape of an RAF roundel, to celebrate the 100th birthday of the RAF. The Green’s Community Garden, situated on the corner of Criffel Street and Lawn Terrace, was designed with input from local people. The garden was opened in May 2014 and is cared for by dedicated volunteers. 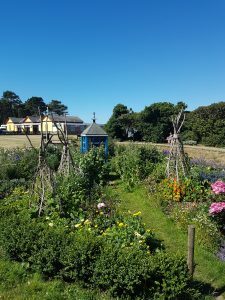 The Heritage Rose and Bee Garden is situated closer to the sea, with a bee hotel in the middle of a striking display of rose bushes, plants and shrubs which have created a haven for the local bee and butterfly population, again cared for by dedicated volunteers.